Toshiba CB30-102 13.3 inch Laptop Intel Celeron 2955U 1.40 GHz 2 GB 16GB SSD. Special offer includes Head Set & Wireless Mouse. Toshiba brings out a splendid device with extreme portability to make your productivity more enhanced by offering unique features and improved functionality. 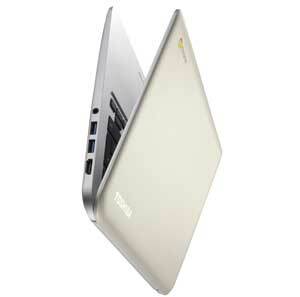 Toshiba CB30 is a highly portable laptop as it is really light with seek and slim design. 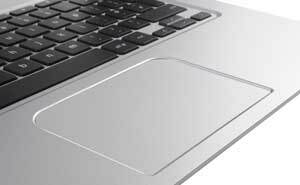 These laptops are particularly designed with the view of having maximum portability without fatiguing your hands. For this purpose Toshiba has kept the laptop light weight and slim cool design to carry the style of grace along with you. Powered by Intel Dual Core Processor, Toshiba Chrome book works with faster speed needed to have flawless transitions and boot systems. Coming with the amazing backlight technology, the HD screen serves you with stunning display making the light colours to appear at their brightest and darks to their darkest. The Toshiba CB 30 lets you share the content seamlessly with wide array of connectivity options, equipped with two USB 3.0 ports, HDMI and SD card slots. USB 3.0 ports, making it quick and easy to transfer large data swiftly to other devices and connecting to other devices. 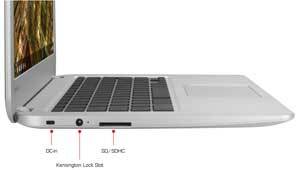 The Chrome book comes with superb battery timing, a long life of total 9.8 hours so this means you can work all day long without worrying of battery drainage quickly. 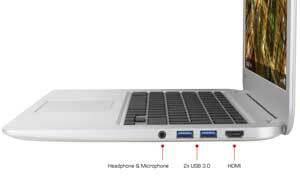 Enjoy songs, movies and games with the Toshiba chrome book built in stereo speakers. You can play your playlist loudly in crisp sound with your friends. This amazing chrome book is paired with the two amazing items in bundle offer. It comes with super quality 2xl headphones and a stylish wireless mice.